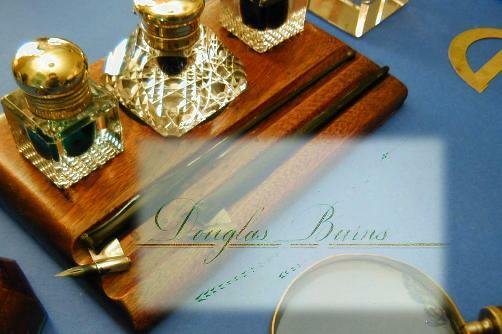 Douglas W. Burns is an internationally-acclaimed master calligrapher and designer of the written word. He has created beautiful gifts, wedding and party invitations, personalized table placecards, menus, stationery and logos for his many clients who enjoy expressing their appreciation of their guests, friends and customers. Doug Burns always lavishes each project with the individual care and attention that cannot fail to bring pleasure to the recipient of his work. As you read this website, we hope that your imagination is kindled with thoughts of how you can use the beauty of calligraphy to enhance your next social function or your business endevours. or by electronic mail at douglas@dwbcompany.com.